Last month we discussed ticks and the freezing weather. 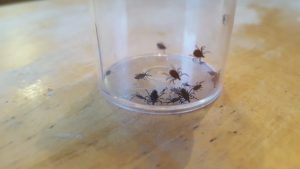 I predicted that “as soon as the temperatures rise into the mid-30s (and we know you will be out enjoying the veritable heat wave), ticks will be questing”. February 21, 2018 was an actual heat wave with temperatures reaching the mid-70s in parts of upstate NY. So in an attempt to justify spending a portion of the workday outside, tick sweeping was added to the to-do list. It’s a small park, but there is enough habitat here to support a large number of adult blacklegged ticks. 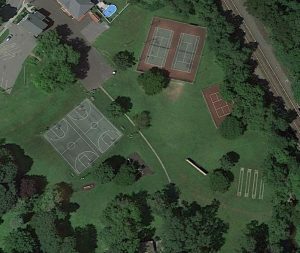 I visited the rail trail and a small village park (think playground equipment, tennis and basketball courts, and horseshoes) with some woodlands along the edges. And in less than an hour I had 26 blacklegged ticks in my pocket. I didn’t wait too long before heading home to throw my clothes in the dryer and take a shower to conduct a thorough tick check. How about you? Did you spend anytime outside during the warm weather? Did you check for ticks? If not, it’s not too late. If you did pick up a tick, it is likely embedded by now. Use your eyes and fingers to search all parts of your body. Read this past blog post on conducting a tick check. Do it now. (Don’t remove any ticks you find yet, just go look.) We’ll wait. Get yourself some super-pointy tweezers, the type that airport security would probably confiscate. Be firm: steady and straight up until that sucker lets go. Hopefully you did not find one, but if you did you might have been exposed to a tick-borne disease. While there is a debate in the medical literature about how long it takes for a tick to pass along a disease, there is consensus that removing the tick as quickly as possible in a safe manner is important. Use very pointy tweezers, grasp the tick as close to the skin as possible, and pull straight up. 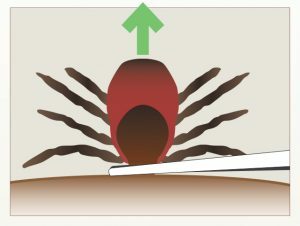 We cover this method as well as what NOT to do in the blog post It’s tick season. Put away the matches. Don’t flush that tick down the toilet. We recommend labeling a plastic bag with the date and where it was attached and putting it in freezer. Or fill a similarly labeled small container with rubbing alcohol and put the tick in there. If you start feeling like you have the flu in a week or two, have the tick properly identified and report to your physician. Keep up your daily tick check even though it’s snowing outside. If you missed one, you still have a few days while it continues to feed and gets larger every day. Knowing that you had a tick feeding for a few days might give you the heebies jeebies, but knowing that you had a tick can help with diagnosis later on as your doctor might not think to check for Lyme disease, anaplasmosis, babesiosis, or Powassan virus in the winter. And remember to take precautions the next time the thermometer hits the mid-30s. Need a refresher? Check out Steer Clear of Ticks and the Diseases They Carry — the IPM Way.